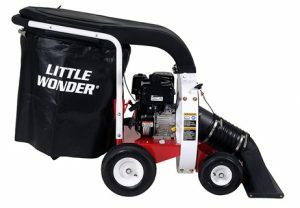 Little Wonder debris and leaf vacuums clear and collect all types of debris – large and small; bottles, cans, leaves, mulch, pine needles, straw, gravel, and other debris that would normally have to be swept up by hand. This walk behind leaf vacuum has superior suction and airflow, the result of our industry-leading impeller housing design. Our design funnels airflow and material down into the bag, filling the bag completely without loss of suction. The top-loading bag boasts a hefty 74.47 gallon capacity – TWICE that of competitive leaf vacuums. You’ll collect more debris per bag and spend less time emptying it. Tackle fall leaf cleanup efficiently. Instead of blowing leaves into piles or raking them up, use a walk-behind leaf vacuum to quickly cleanup any size yard or commercial space. 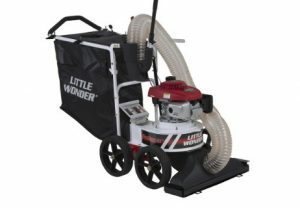 Little Wonder leaf vacuums are excellent for residential cleanup, industrial applications, commercial sites and parking lots. 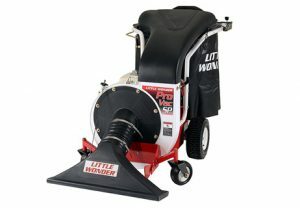 The Little Wonder Pro Vac commercial leaf vacuum is outstanding for residential debris clean-up of yards and driveways, industrial applications, commercial sites and parking lots. These gas-powered leaf and debris vacuums are available in push and self-propelled.